It is very high on Citrix details, typical gotchas, pros and cons. Rob also outlines some of the challenges he faced and how he came out of them. I highly recommend reading it to anyone who plans to deploy Citrix XenDesktop Infrastructure even if you are not planning to use Tintri. The documents go into each step of getting the environment up and running, the behind the scenes of provisioning methods, Pros and Cons of each deployment method, the gotchas within each deployment method, housekeeping, how you should keep the base image healthy, the IO characteristics, the infrastructure behavior during various stages (remember your Tintri storage can see across the infrastructure), how to keep the environment fast and predictable, how one can keep storage efficiency high all the time and the best part – Tips & Tricks. What is my favorite part? My favorite part is the kind of insight you can get because of Tintri’s ability to see across Host, Network and Storage. I’ll give you one example and you can find more in the whitepapers. Below you see two screenshots from the white paper. 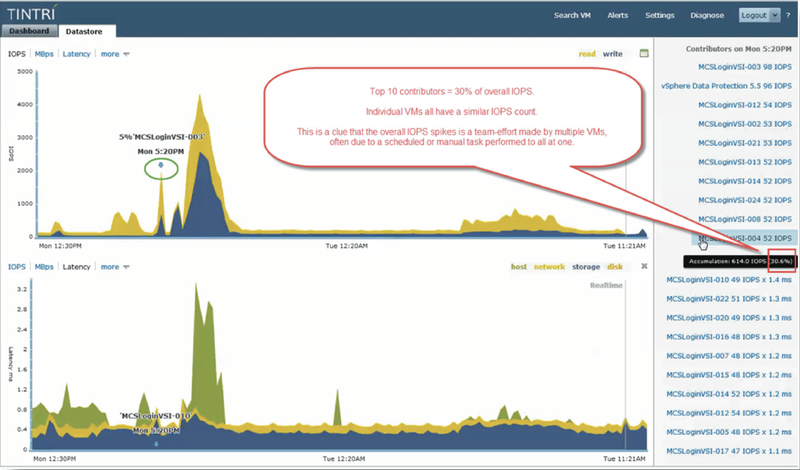 The screenshots are from the Tintri GUI showing 1 day of activity. One of the cool functionalities that Tintri GUI has is that it tells you the top 10 contributors at every point that you click on the graph (you can go 7 days back on VMstore GUI and 30 days back on Tintri Global Centre today). 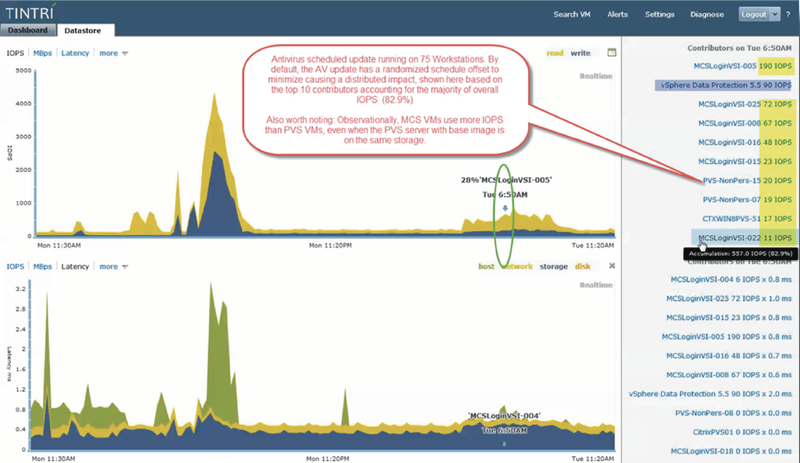 The graphs show the IOPs (read Vs write) and latency details (host, storage, network) at boot up and then explains what happened after a day had passed on a setup where no one logged in. You can find many such details in whitepapers along with a lot of stuff I mentioned above. The ability to go almost Zero on configuration details and Tintri’s ability to see across the infrastructure allows us to include lot of these things. From best practices standpoint, there are no complex details to remember or follow (RDMs, separate partitions for DB/logs, tuning parameters, block sizes, yada yada…). Just map your Tintri Datastore to your servers, start adding your VMs and watch your Tintri storage See, Learn and Adapt to the application. This entry was posted in Citrix, Tintri and tagged Best Practices, Citrix, Tintri, VDI, XenDesktop by Satinder Sharma. Bookmark the permalink.